The Old Pioneer Store and Emporium is nestled in the middle of historic Downtown Big Rapids-home of Ferris State University and in the former building that housed the Pioneer Newspaper. Locally owned by Brian and Carlleen Rose this award winning store is proud of the community it serves. 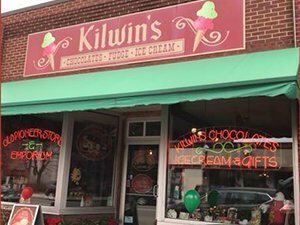 To get into The Old Pioneer Store and Emporium you will need to first enter the Kilwin’s Ice Cream, Fudge and Chocolate Shop and walk through into The Old Pioneer Store and Emporium. The building is like an indoor mall as you discover yet another building to enter with even more surprises to see!